President Trump wants a new trade deal with Mexico and Canada soon. But he's running out of time. Trump says his promise to get tough on America's trade partners -- particularly China and Mexico -- is a big reason why he was elected in the first place. "It's probably one of the primary reasons I'm sitting here today as president," Trump said on April 20. 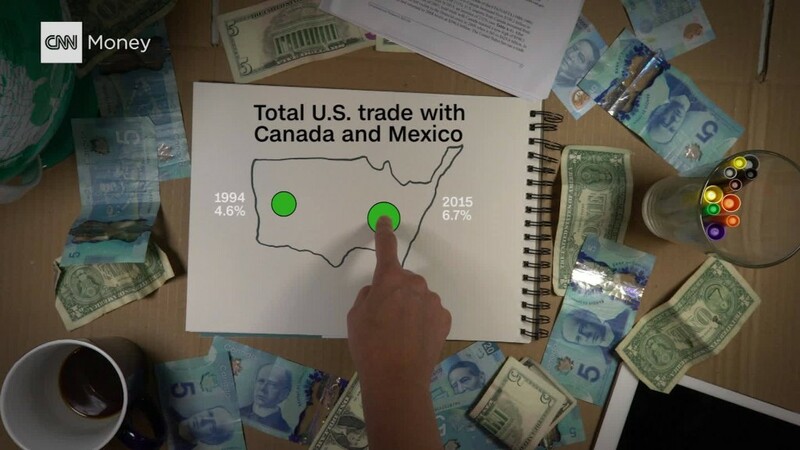 He's labeled NAFTA, the free trade deal with Canada and Mexico, the worst in history. Adding uncertainty to NAFTA's fate, two senior Trump administration officials told CNN on Wednesday that Trump is considering an executive order to pull out of the deal. Trump has said he wants a deal that benefits US workers, but hasn't said exactly what he wants in a new deal. If Trump decides to stay in and renegotiate, time isn't on his side. His trade team, led by Commerce Secretary Wilbur Ross, must trigger a 90-day consultation period before trade talks can begin. At the earliest, talks could start in August. Edward Alden, a senior fellow at the Council on Foreign Relations, said "it's completely unrealistic" to get a deal done this year. "The notion that you're going to have a negotiation that's both fast and productive is just an illusion," Alden added. It's also worth noting that the original NAFTA agreement, which became law in 1994, took years to put together. Mexican leaders want negotiations done by early 2018 because Mexico has presidential elections in July of next year. There's no telling whether the next Mexican president will cooperate with Trump on NAFTA. "It will be in the best advantage of the countries involved that we finish this negotiation within the context of this year," said Mexico's economic minister, Ildefonso Guajardo, to CNNMoney earlier this month. Trump added a twist to talks on Monday, slapping a 20% tariff on Canadian softwood lumber. Experts say that won't help Trump's future trade negotiations with Canada. "You've disturbed a lot of waters. It's going to be a long negotiation," says Gary Clyde Hufbauer, a trade expert at the Peterson Institute for International Economics. "Getting a deal done by early 2018 or the end of this year was wishful thinking." Canadian leaders denounced Trump's decision, saying it was made on "baseless" accusations of government subsidies provided to Canadian lumber companies. And Canada isn't even Trump's main target. Mexico is. Experts say Trump could use all the help he can get from Canada if he plans to strong arm Mexico. Mexican and Canadian leaders say they're ready to negotiate. They're just waiting for Trump. "We are ready to come to the table anytime, but the United States, in fact, has yet to actually initiate the negotiating process," Canada's Foreign Minister Chrystia Freeland told CNN on Tuesday. The Commerce Department and the White House were not immediately available for comment.